The word 'indaba' is a Zulu one for a meeting of elders. According to tradition, they would gather, often under an indaba tree, to discuss matters of common interest, from legal judgements to marriages and treaties. These days, it has been adopted by South Africans of all hues as a general term for meetings, exhibitions and conferences. And then there is Indaba, with a capital I.
Indaba is South Africa's great tourism showcase to the world, the largest incoming travel trade exhibition in Africa, held annually at the Albert Luthuli Convention Centre (Durban ICC). In 2014, the dates are from 10-13 May. Now in its 34th year, it attracts nearly 1,900 exhibitors and 13,000 delegates. People flock in from across the world to do talk about tourism in southern Africa and do the deals that will power the tourism industry for the next 12 months. Many thousands of dollars worth of deals are negotiated on the exhibition floor, in backrooms, over drinks and the inevitable South African braais. Most go on to do post-fam tours of South Africa. The ICC was built in 1997, since when it has won the World Travel Awards title as Africa's Leading Conference Centre eight times. It can house up to 10,000 delegates. 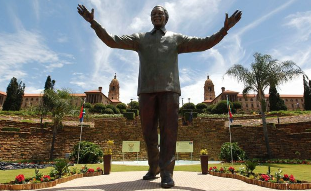 It is named after South Africa's first black Nobel prize winner, iNkosi Albert Luthuli, president of the African National Congress from December 1952 until he died in 1967. Directly across the road, and also used during Indaba is the Durban Exhibition Centre. Both are in central Durban, a few minutes' drive from the beachfront Golden Mile and only about 15 minutes' drive from Durban airport. The Cape Gourmet Festival: It never ceases to amaze me how much of a gourmet haven South Africa really is. The Cape Gourmet Festival is a shining example. If you ever wanted to combine a tour of the country, with an exciting special event in Cape Town, this is it. Check out our special page. Penguins at High Noon. Did you know that there were penguins in South Africa? Now you do! I saw my first South African penguin while visiting Robben Island prison in Cape Town's scenic and historic harbor. This little fellow came around the corner from his hiding place behind a clump of bush and we met face to face. It reminded me of a scene from the movie "High Noon" as two strangers eyeballed each other on the main street. Later that week I would encounter dozens more of his gang frolicking on the beach. Visitors to the area will discover an entire colony of Jackass penguins lounging and fraternizing (with each other, not the tourists) at a local community called Boulders, not far from Cape Town. Photo by Muguette Goufrani.